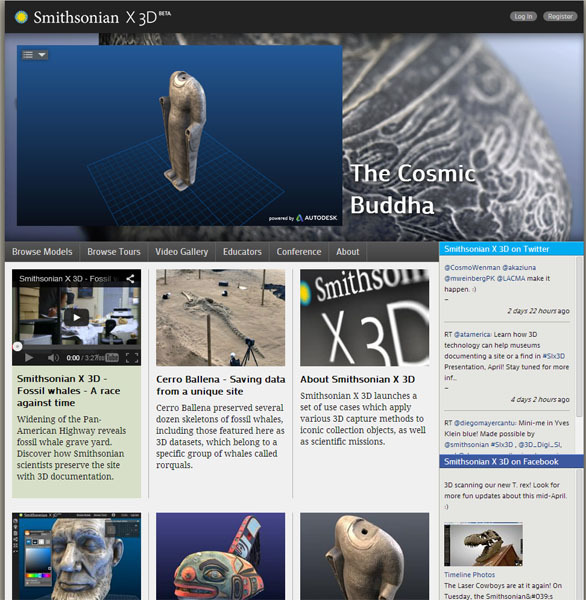 The Smithsonian X 3DThe Smithsonian X 3D launches a set of use cases which apply various 3D capture methods to iconic collection objects, as well as scientific missions. These projects indicate that this new technology has the potential not only to support the Smithsonian mission, but to transform museum core functions. Researchers working in the field may not come back with specimens, but with 3D data documenting a site or a find. Curators and educators can use 3D data as the scaffolding to tell stories or send students on a quest of discovery. Conservators can benchmark today’s condition state of a collection item against a past state – a deviation analysis of 3D data will tell them exactly what changes have occurred. All of these uses cases are accessible through the Beta Smithsonian X 3D Explorer, as well as videos documenting the project. For many of the 3D models, raw data can be downloaded to support further inquiry and 3D printing. Last Edit: 2014/04/01 16:30 By Kraftwurx Designs.